Do you want to see how I organise my blog content for a whole year, with a simple spreadsheet? In this video, I’ll show you how I’m preparing for the coming year with my really simple spreadsheet that shows me affiliate promotions, product launches and blog content for the next 12 months. Scroll to the bottom to get a copy of the spreadsheet you can see in this video. There’s a transcript of the video below. 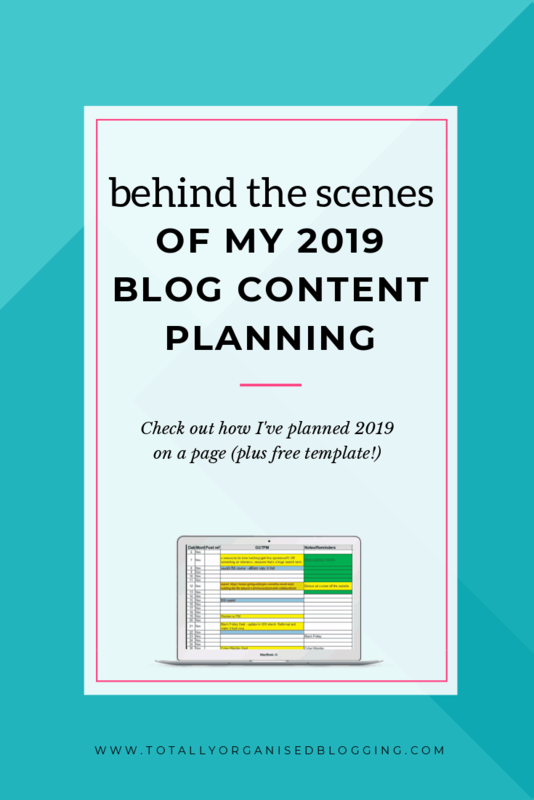 Hello everyone, it’s Elizabeth here from Totally Organised Blogging and I wanted to show you behind the scenes of my 2019 publication schedule, my content calendar for the coming year to give you a bit of an idea about how I organise my content. Perhaps you could take something from that for your own organisation. Let me show you a bit about the spreadsheet first. I have the days and dates months and then a post reference. You can see here the post references used for a numerical reference so that I can easily find my content relating to that blog post in my folder structure. What you can see here is the titles I’ve dropped in for January, through to the beginning of February. January is always a really great time for me because I tend to do very similar articles every year. I’ll have an expert roundup: great tips for 2018. I’ll have something around productivity because there’s a whole host of people looking for productivity stuff in the project management world, early in January. Then I will have an article on certification. Lots of project managers tend to look for what exams they need to take for the coming year, something around personal development. Maybe that would fit quite nicely with your topics as well. You can see that most of these are updates and reprint, which means I’m going to take content I’ve already produced and tweak it maybe add new pictures, maybe add a video, maybe update some of the things that need to be updated for the 2019. I’ll make sure that’s all available to them so they should be relatively easy pieces for me to put together for the beginning of the year. This is my Girl’s Guide to Project Management blog, so everything I’ll be publishing on that particular blog, and notes and things in here. This is Totally Organised Blogging where I have a goal for myself. I’m going to post a blog once a week and do an email. Sorry, post a blog post once a fortnight and do an email once a fortnight, so hopefully you’ll be hearing from me on a more consistent basis. Yellow means I haven’t done anything. No prep, I’ve just got an idea. If we go further down you’ll see that some of the yellow boxes don’t even have any words in. Here in this point from July, I run out of ideas. I’m sure I would have thought of something to blog about by July, but at the moment there’s nothing particularly that springs to mind that fits in with that summer period. Going back up to the top, you can see it’s a bit more populated, but [yellow means] I have an idea, I have the bones of an idea; there’s something there that I can work on to get a blog post up and running. Blue means email. These are things that I’m going to cover off in my email. I want to share with you the career planner for 2019 that I’ve got, which I think is also a helpful tool for blogging goals and finding a bit of balance between career and blog, for those of you who are working full time. Orange means I already have some substantial information already drafted, so that might be that the blog post has already been drafted or in this case that I’m updating and reprinting an existing piece. It means I’m not starting from scratch. My goal is that all of the colours disappear, so if there’s no colour on a cell in the spreadsheet, it means the piece is ready. It’s scheduled in WordPress and it will publish on the day that I want it to publish. So my goal is to clear the colours off of the sheet, which I like to do at least a month in advance. Sometimes I’m doing it the night before! If I scroll down quickly and I’m seeing blocks of colour, those are the areas where I need to be making sure that my content is up to date. Generally GirlsGuideToPM.com is fleshed out a little bit more. At the beginning of the year we’ve got all kinds of updates and reprints. Things that people are thinking about and searching for at the beginning of the year. Then I’ve also marked on here where I know there are affiliate launches. This shade of blue is Ultimate Bundle sales. There’s a Genius Bloggers Toolkit flash sale. I’ll probably email people about that. Over here I want to do something for International Women’s Day. You can fill up your content calendar with a whole host of stuff around events. If you already know when you’re going to be doing affiliate launches, when you already know you’re going to be doing a product launch of your own products or you want to tie in with something that’s happening in the world like International Women’s Day, then it’s certainly something that you should be putting onto your content calendar now so that you’ve got enough time to plan out your content around that. Then as we get closer to the end of the year — there’s a product launch here, this is me doing a product launch. Towards the end of the year, I’ve got another thing there that’s launching. There’s some holiday related activity that I’ve planned in. Just like I find January relatively easy to plan for because a lot of it is around goal setting, productivity and things like that, the end of the year is also quite easy to plan for. You could do that now for your blog because you probably know already that you want to be doing a gift guide roundup or you want to be looking at trends that happened over the last year and that you write in your trends for the 2020. You’ll be writing those in December. Here I’ve got 2020 career planner launch. I’ll be doing that early in November. There’s something around Black Friday, something around trends I saw during the year and what that’s going to look like for 2020. I’ll do a roundup of industry conferences. That’s another good one for bringing in search engine traffic. I will have something that just sort of says thanks very much to everybody for your contributions to my blog over the year. So I will shout out to providers who have given me things. People I have done reviews for and my own team and then there’ll be some kind of happy holidays thing at the end, so the last six weeks of the year. It’s actually really easy to plan out. Once you’ve planned the beginning of the year and the end of the year and you’ve done your promotions, you’ll find that you actually haven’t got that much left to work out what to say. Then you can do some brainstorming, thinking about the kinds of topics you want to do, schedule them and I think if you’re anything like me, you probably have more ideas about what to write than time in the day. I start with the big things. I want to make sure I get in like my affiliate promotions and I want to make sure I’m not exhausted my list by doing selling, selling, selling all the time. So I try and spread those out and then drop other things and other pieces of content around that. That leads up to the product launch that I wanted to do or supports the fact that we are about to move into some kind of promotion or ties in with something. Somehow. I think when you see it all in a year like this, it’s actually not as daunting or perhaps you find it daunting. I don’t know. I find it not as daunting because I can quickly scroll through and see exactly what I’m supposed to be working on when and what’s coming up in the month or the quarter to follow. Anyway, I hope you found that useful. That’s a behind the scenes guide to my publication schedule, my content calendar for 2019 for my main blog, Girl’s Guide to Project Management, and the blog related to this Facebook page, which is Totally Organised Blogging. Have a great weekend. Bye. I help bloggers get organised, stay organised and do more with less stress.